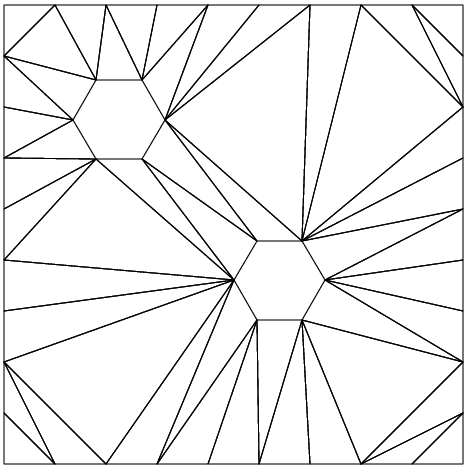 TRIANGLE is a C program which generates meshes, Delaunay triangulations and Voronoi diagrams for 2D pointsets, by Jonathan Shewchuk. 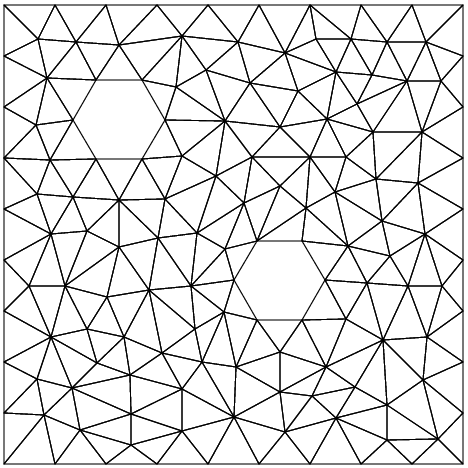 TRIANGLE generates exact Delaunay triangulations, constrained Delaunay triangulations, and quality conforming Delaunay triangulations. The latter can be generated with no small angles, and are thus suitable for finite element analysis. The instructions are long; you'll probably want to pipe the output to more or redirect it to a file. The programs gives a short list of command line options if it is invoked without arguments. You have to give TRIANGLE some input to work with. Usually, you start with a Planar Straight Line Graph (PSLG) which defines a set of points, and some nonintersecting segments that you want to be sure are included in the triangulation. This information can easily be stored in a POLY, which is one of the expected input formats. Normally, TRIANGLE will triangulate the entire region defined by the convex hull of the points. 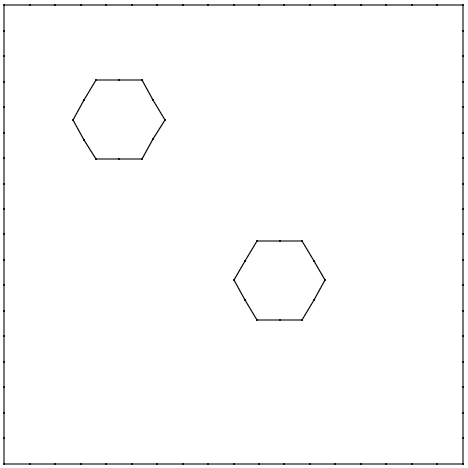 You may define a portion of the convex hull to be a "hole", which is not to be triangulated. 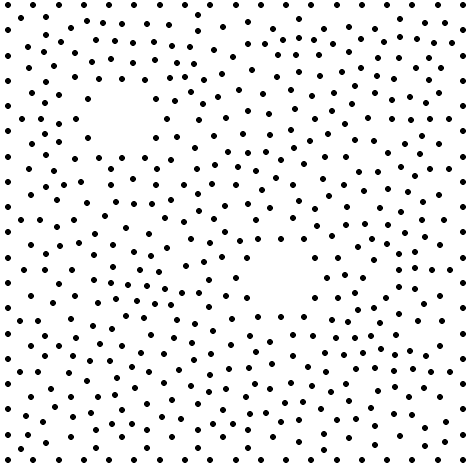 This is done by adding some hole information to your POLY file. TRIANGLE will read the Planar Straight Line Graph defined by A.poly, and write its constrained Delaunay triangulation to A.1.node, A.1.ele and A.1.poly. Now, click on the same "ele" button. 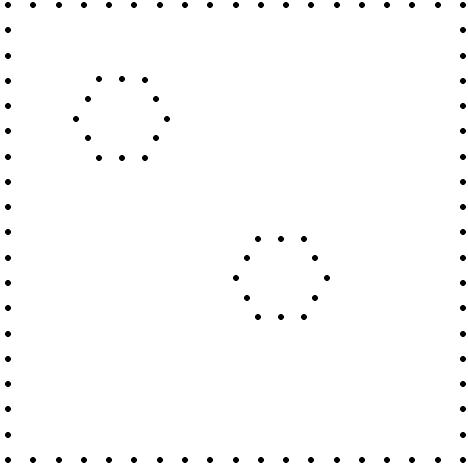 A new triangulation will be loaded; this one having no angles smaller than 20 degrees. TRIANGLE is available in a C version. FEM_TO_TRIANGLE, a C program which reads FEM files defining a 2D mesh of triangles, namely a file of node coordinates and a file of elements defined by node indices, and creates a corresponding pair of node and element files for use by Jonathan Shewchuk's triangle program. POLY, a data directory which contains a description and examples of the POLY file format. SHOWME, a C program which can display the POLY files uses as input to TRIANGLE, and the output files that define meshes and other objects. TRIANGLE_BENCH, a script which times the execution of the triangle() program on a sequence of sets of randomly generated nodes in the unit square. TRIANGLE_FILES, a data directory of examples of files used by the triangle and showme programs. TRIANGULATE, a C program which reads data defining a polygon and produces a PostScript file describing a triangulation of the polygon. TRIANGULATION, a C library which performs various operations on order 3 (linear) or order 6 (quadratic) triangulations. TRIANGULATION_TRIANGLE_NEIGHBORS, a C program which reads data defining a triangulation, determines the neighboring triangles of each triangle, and writes that information to a file. Volume 23, pages 345-405, September 1991. Volume 18, Number 3, pages 548-585, May 1995. 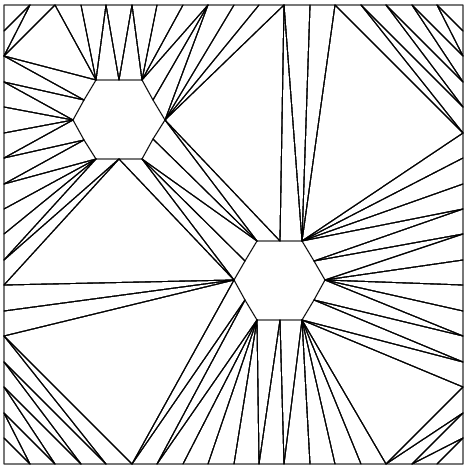 Volume 23, pages 21-74, May 2002.
http://www.netlib.org/voronoi/index.html, the NETLIB Voronoi web site. airfoil_interior_elements.png, a PNG image of the level 1 mesh. airfoil_interior.1.ele, the level 1 element file. 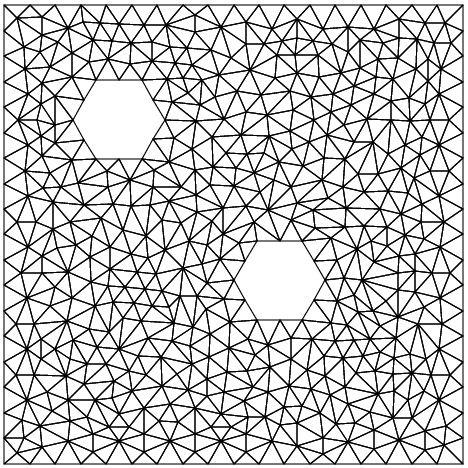 double_hex.1.node.png, a PNG image of the nodes. double_hex.2.node.png, a PNG image of the nodes. 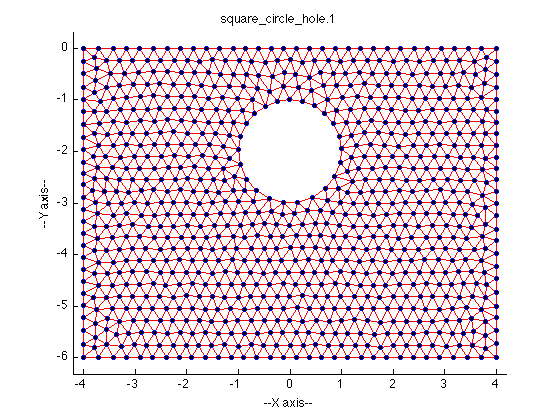 square_circle_hole.1.png, an image of the triangulation. Last revised on 09 October 2014.